@nblumhardt Just wondering if you can take more inspiration from elsewhere - maybe Lucene and RavenDB? Hybrid C#/SQL language is weird? There are still some questions to answer around how much this flows back the other way into typical filter expressions. On the one hand, it’d be nice if the filter syntax and the where clause syntax were identical so that translating between queries and filters is trivial. On the other hand, keeping the languages a bit tighter seems wise. For now, the syntaxes are the same; I’m going to spend some time using the SQL syntax in filters and see how it goes in practice. Anyway, back to the topic at hand. Now we’re getting somewhere! The aggregate query parser handles the syntax, the planner can produce a query plan, and we need to turn that into a result set. What inputs are fed into the executor? What does the result set look like? How is the result computed? I decided for now to keep the concept of “time slice” or sample separate (time could simply have been another column in the rowset) because it makes for a friendlier API. I’m not sure if this decision will stick, since tabular result sets are ubiquitously popular, but when “series” are added as a first-class concept it is likely they’ll have their own more optimal representation too. 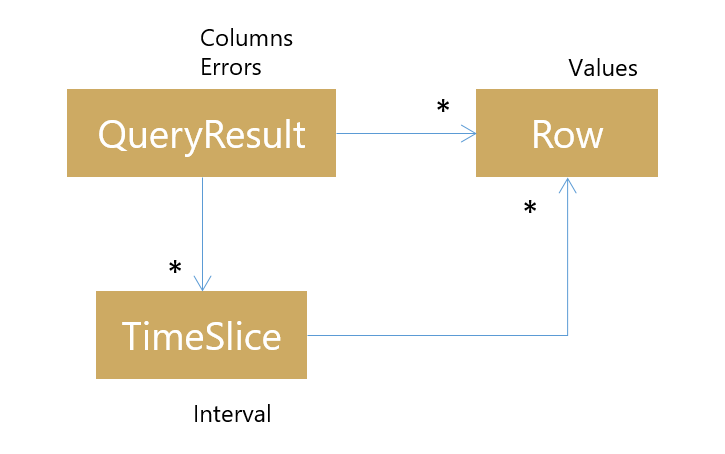 In between these two things – an input query plan and an output result – magic happens. No, just kidding actually. It’s funny how, once you start implementing something, the magic is stripped away and things that initially seem impenetrably complex are made up of simple components. The value to be aggregated is passed to the Update() method (in the case of count(*) the * evaluates to a non-null constant) and the aggregation adds this to the internal state. Once all of the events have been processed for a time range, Calculate() is used to determine the final value of the column. It’s not hard to map count(), sum(), min(), max() and so-on to this model. Once results have been computed for a time slice, it’s possible to iterate over the groups that were created and output rows in the shape of the QueryResult structure shown earlier. There’s obviously a lot of room for optimisation, but the goals of a feature spike are to “make it work” ahead of making it work fast, so this is where things will sit while I move on towards the UI. In the next post (Part 6!) we’ll look more closely at Seq’s API and finally see some queries in action. Until then, happy logging!